The viewing room is the space where you can view online exhibitions throughout the year. While the other pages on the site provide an overview of what I am presently making, the Viewing Room focus is on some of my other interests. Whether retrospective surveys of some forms I enjoy making, a look at pots from my collection of other artists' work which may have inspired me or the work of my former assistants, the Viewing Room exhibitions will, I hope, make your visits to our website even more meaningful. It is fitting to identify the "guiding spirits" who have been important to our learning and in whose steps we follow as we pursue our life's work. What better way than to recognize and honor those individuals who inspired, encouraged and, above all through their works, provided a benchmark by which to measure and define our own progress and growth. Two whose lives and works offered me such a standard come immediately to mind. Potters Kawai Kanjiro and Ruth Gowdy McKinley and their wares have been deep sources of strength to me over many years. At a later time I will comment on the influences of my two teachers, William Pitney and Maija Grotell. 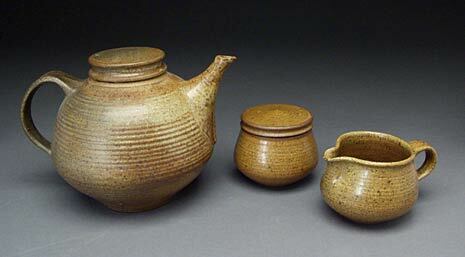 I first saw work by Japanese potter Kawai Kanjiro in Bernard Leach's "A Potter's Book" in the early 1960s, and I recall being moved by the elegant beauty of his forms. 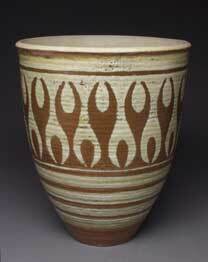 The particular pot that held great attraction for me then was a simple rectangular, slab-formed, lidded box. It wasn't until years later that I became more fully aware of the breadth of Kawai's work with respect to both form and surface enrichment. Between 1962 and 1984 I had occasional glimpses of Kawai's work in catalogues and books. I had begun to realize that he had diverse interests and a very inquisitive nature, especially evidenced in the decorations on his pots. Still, I had no true appreciation of the range of his interests. All that changed when potter Bill Hunt, my colleague and good friend, gave me a richly illustrated color catalogue of Kawai's works. I felt then and still feel as if I had been given a passport that allowed me to journey into a region of far deeper insight. What moves me most about Kawai's output of work over a long life (1890 - 1966) is the profound range of interest in form and surface he encompassed. His work falls into three stylistic phases. 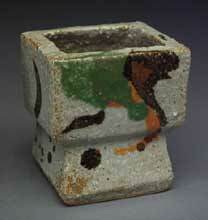 Beginning with pottery forms influenced by Chinese and Korean ceramics, evolving through some highly idiosyncratic personal explorations of form and surface, his works evolved further to a painterly and more restlessly experimental series from which the small vase form illustrated here doubtless came. Ranging from that undecorated, lidded box, seen during my student years at Cranbrook, to the lush surfaces of his more painterly works of the 1960s, the duration of Kawai's active years (which appear to span the fifty-two years between 1914 and 1966) awes me. Viewing Kawai Kanjiro's extraordinary output, I find a special kind of encouragement that I have tried to apply to my own life and work. The lesson is to follow one's instinctive urges to explore, not to hold the possibilities of one's new work hostage to what was done in the past. And - judging by and trusting my instinctive reactions as I look at Kawai's joyfully conceived surfaces - to have fun, to cherish the personal search toward a goal, to manifest that enjoyment in tangible form . . . the pot available for all to see and appreciate. I am sure that I first saw pots made by Ruth Gowdy McKinley in the early 1960s, as her career began in earnest after she received her MFA in ceramics at Alfred University in 1955. 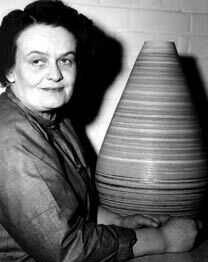 I was entranced, as a student in the late fifties and early sixties, with the work of potters who made functional pots - and Ruth was one whose forms and surfaces commanded my attention. About the same time that I began my own studio work in 1964, Ruth gave a workshop in Albion, Michigan. Because she was one of my "idols" in the clay field, I made sure to go. In the exhibition of her work that accompanied the workshop there were a good number of her pots that had been wood fired. Call me star struck (or call me na�ve), but I introduced myself during the workshop and asked if she would like to trade work! Graceful person that she was, Ruth agreed to trade with that somewhat forward, newcomer - potter, and thus began a friendship that lasted until illness sadly took her from us all in 1981. The tea set shown here was from one of our trades made over the years. What is it about her work that so moved me then . . . and continues as strongly to do so today? It is work that is beautifully and elegantly fashioned. Ruth achieved a singularly refined sense of proportion and scale in her forms. Restrained and almost austere, they nevertheless convey a generosity of spirit that always draws visitors to our collection directly to her pots. Interestingly, while we often refresh the collection with a rotating array of potters' works, Ruth's pots are always there to see. Enduring quality! When a studio assistant asks me, during discussions of pieces in our collection, what it is that I draw from her work in particular, I try to express this idea. Ruth's work makes me happy to be myself, learning to make work and trying to become more understanding of form. Her life and her work are examples of integrity and honesty that serve as a beacon to me. I say that it is good to be in a world with potters who care as much as she did. Great and inspiring teachers are among life's finest blessings. During my years of formal education, three superb teachers came into my life. materials of her craft classes seemed to come alive in our hands. Metals, leather, enamels, clay... we became enthusiastic experimenters under her gentle guidance. Fortunately for me, Ms. Munro had a great sense of humor and could appreciate mine, which fortunately fit easily into her not-too-structured, laughter-filled crafts studio in the old high school maintenance building at Cooley High. Of those long ago moments, what I most recall were the thrills that accompanied the forming of materials ...the dawning awareness that I could conceive of and follow through with my ideas for shape and surface. Ms. Munro also encouraged my entrepreneurial efforts in the basement studio of my home, where I made enameled jewelry and then sold it to students and teachers to earn pocket money. This was my first experience of having a respected teacher influence my path toward a career in the crafts. "Myrt"(as she eventually asked me to call her) and I stayed connected and corresponded after she retired and moved to California, and right up until her death. Her friend told me that she continued to teach and encourage kids and adults well into her mid-90's! I sent pots to her during the many decades following her retirement. After her death, a close friend of Myrt's told me that she had kept all the pots, brochures, and memorabilia of my career displayed in a special place in her apartment. This friend told me that she felt she'd come to know me herself though the dialogues these two women had shared throughout the years. Profound thanks for those encouraging and empowering times together, Myrt. You are often in my thoughts. You sowed seeds of caring about materials and about ideas of craftsmanship, and these continue to bear fruit. I am proud to have been one of your "crafts kids!" Energized by the momentum of my high school experiences with Myrtle Munro, I came to Wayne State University's Fine Arts Department to inquire about the crafts program. This next phase of my education proved to be perfect: with my own bountiful excitement I encountered the solid capable educator, William Pitney. 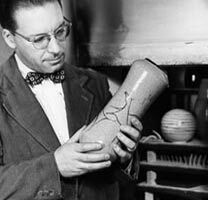 Educated at the (almost legendary) Alfred University, Bill Pitney was consummately prepared to teach a concentrated course for potters. In many ways Bill taught his classes as if every single student was destined to become a full-time potter, when, in fact, only a few followed that path. (Pity the poor students who took his classes just to get some credits!) Bill was a demanding teacher, and in return he provided wonderfully rich learning opportunities, encouraging me to research materials, test glazes, and investigate studio practices, all of which proved formative. He guided me in conceptualizing how to tackle problems and how to work through to real solutions. It was in long discussions with Bill Pitney that I was able to articulate the first tentative questions about a career in this field I was falling in love with. Although not a full-time artist himself, Bill never let my dream of becoming a studio potter feel out of reach. In fact, being his studio assistant for three years gave me the exact responsibilities which are necessary for every studio artist with a full-time studio practice -- ordering raw materials, loading kilns, and cleaning and repairing equipment. Truthfully, it was in Bill's class that I had my first real "ahah" experience of being able to envision my future and somehow know to trust it. In retrospect, I realize that I needed to "practice" conceptualizing future possibilities and directions, and it was Bill who patiently helped me sort though that maze of early choices, enabling me to gather sufficient momentum. The hardest part for both of us was when my undergrad studies at Wayne State came to an end and I decided to seek a Masters degree elsewhere. Though disappointed, Bill sent me off to Cranbrook Art Academy with his blessings. He's followed my professional career closely for 40 years, and says that he is always surprised (and proud) when I credit him with so much of my good training. Bill is in his ninth decade of life now. 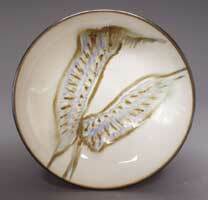 As with Myrtle Munro, he continued to help others learn about ceramics late into his life. Bill is now constrained by Parkinson's disease, but -- ever generous -- Bill has become "the music man" in his retirement setting for the elderly, where he is in charge of providing recorded music for entertainment. For years, his wry, irreverent humor and commentary arrived in long letters with neatly typed pages. These days he occasionally communicates by email! My experience with MAIJA GROTELL at Cranbrook Art Academy was quite a contrast to my years at Wayne State with Bill Pitney. At Cranbrook I was one of eleven graduates from around the country, all exceptional students. Although unsettling at the time, it was good to have been jolted from my former role as the most advanced student to one of many such students. I was humbled and awestruck in this remarkably beautiful school, in the same historically significant environment that had already launched so many important contributors to the ceramics field, among them Howard Kottler, Toshiko Takeazu, John Stephenson, and Richard DeVore, to name just a few. The large collegial work environment at Cranbrook was radically and ideologically invigorating for me, and yet it was my interactions with Maija Grotell that had the more enduring impact. It was not Maija's style to call together students for a "lecture" or to hand out study notes. Instead, her instructional style was idiosyncratic, usually taking place in individual meetings in her holy of holies: her studio/office -- often behind a closed door. To this day I can still recall the sound of that door opening... signaling her time to sally forth -- leaning forward, arms tucked behind her back -- for a stroll through the studio spaces, scrutinizing students' projects and keeping tabs on the flow of things. Since my workspace adjoined her office, I was keenly aware of the comings and goings of students who visited her, and of the coveted opportunities available for one-on-one time with Maija. By early 1961, I had the good fortune to be named her studio assistant, allowing me to have more frequent dialogues with her. Through the years as I've talked with Cranbrook graduates about their own memories of dialogues with Maija, their recollections differ markedly from my own. My most persistent recollections are of long talks that often began with pottery issues but which soon metamorphosed into topics about the beauty of the natural world. Maija possessed an abiding love of nature, which holistically included the land and sea and sky, and most especially animals. So from the very beginning of my two-year tenure at the Academy, she and I spoke of pots, and issues of form and scale. Still, the subject always managed to swing back to some connection with nature or the cycles of the seasons. In her studio she kept beautifully illustrated books on the world of nature, which she often used to amplify her point. When asked about Maija's principal influences on me, I relate my "learning" to those talks about the natural world. As I live the progression of my studio life, I encounter familiar rhythms and patterns so evident in nature's seasons. As my own years passed, her stories and observations about the connection of all living things naturally found their way into my thinking and work. It took me awhile to knit it all together, but now I see her intentions more clearly�much more than when, in my eagerness, I'd bend the rules by climbing into the Ceramics Department studio window at 6:30 a.m. to get the jump on the day. Maiya's wise comments were treasures of lasting value -- their initial opaqueness the perfect "time release mechanism" to insure that their meanings would ooze out over my lifetime. Even now, the layers of her obscure meanings are still being revealed to me. Fascinating! Maija's stories were distilled to a process of questioning and learning based on being constantly inquisitive. In my studio work, I found myself endlessly asking, "What's next?" or "What if?" Perhaps the essential lesson of those long dialogues over my two-year masters program came down to this: Maiya helped me discover that there is no final solution... only more inquiries and more discoveries. My approach to making evolves in its own natural cycle, and (thanks to all those "whys") it grows�giving energy back to me and the work. 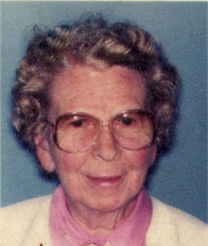 To summarize, the energy of that high school youth was awakened by a wise and generous teacher, Myrtle Munro, and was then channeled and supported with strong undergraduate training by William Pitney, and went on to find full focus in a challenging, advanced studies environment with Maija Grotell. Each of my teachers gave me a set of "tools," which metaphorically have become my "tool shop." The skills, attitudes, inquisitiveness, and training which these three remarkable individuals gave have made my work life infinitely rich and varied. Perhaps not surprisingly, I maintain a well-stocked room filled with power and hand tools which enable me to explore ideas. I am grateful to touch joy so often in the various processes of my craft, and to note the passage of my time as a potter through the flow of good feelings pouring readily from the clay to me and then back to the project at hand. I know in my maker's heart that three devoted and creative teachers planted well the seeds of inquiry, playfulness, integrity, and caring that keep this growth process alive.